“I’m going to make everything around me beautiful — that will be my life.” —Elsie de Wolfe · My entire life has been saturated in the natural and domestic spheres — both creation and creating. Here I share about not only my art and design work, but the other elements that make up a creative life — home, cooking, sewing, inspiration, nature, travel, adventure. 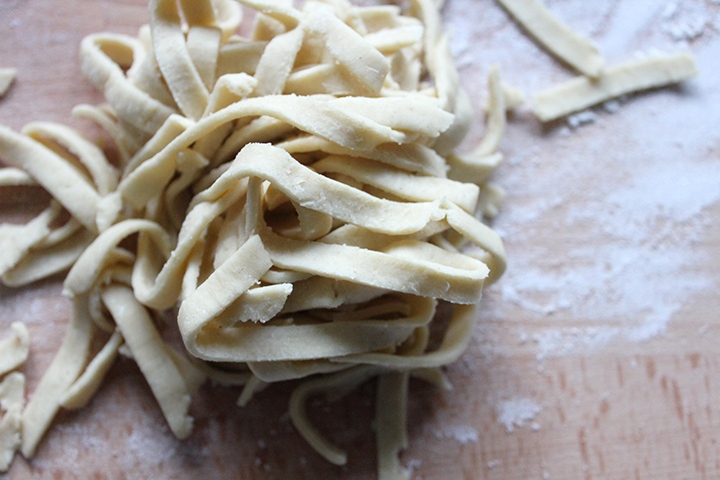 Growing up, my mom would occasionally make homemade pasta with us. It was always a welcome meal and so delicious (and fun to make!). 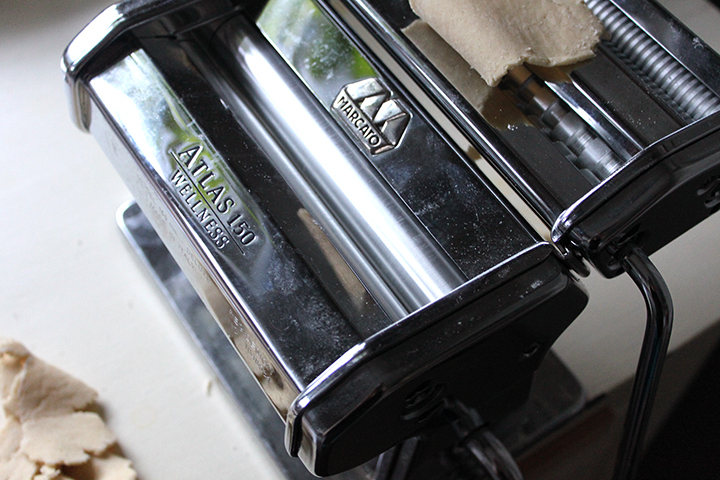 Several years ago for Christmas, Drew got me a pasta machine and I was so excited to finally make homemade pasta myself! It was only a few days later that my nutritionist suggested I stop eating wheat to see if it cleared up my digestive issues and the first thought I had was “oh no! what about my new pasta maker!” I did turn out to have an intolerance to gluten and was thrilled to finally be feeling better. However, it took me a while (several years!) 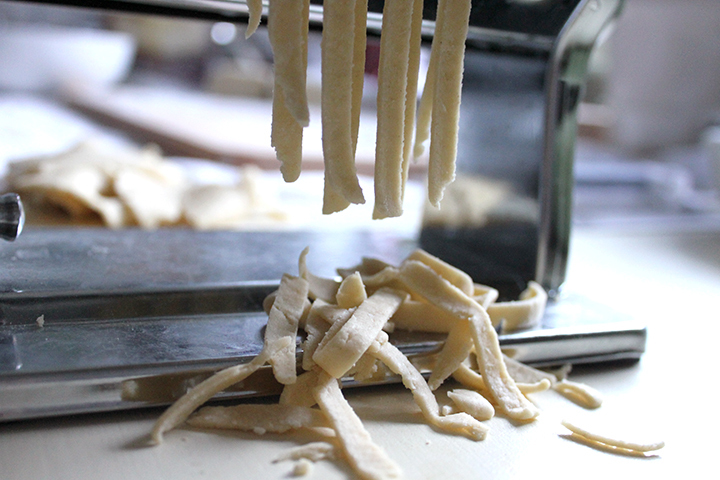 to try making homemade pasta gluten-free, and while it is a little trickier, it is still delicious! 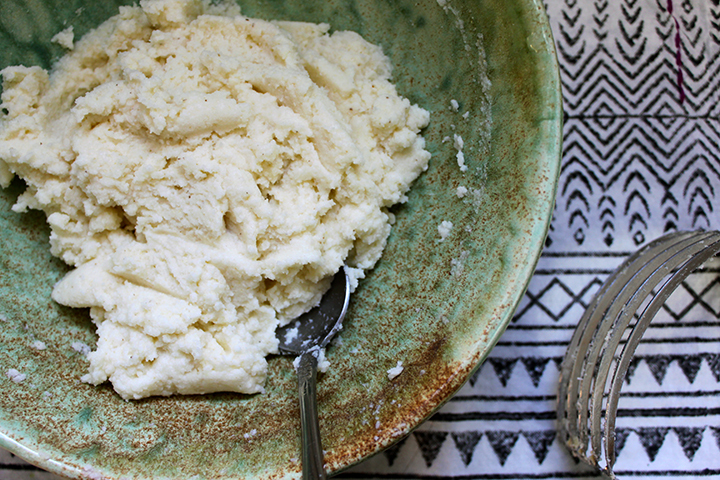 This recipe is simple and easy and I’ve found it to work really well gluten-free! 1. Mix flour and eggs together in food processor until a dough forms. 3. Cut dough into four sections and flatten each on floured surface. 4. Run flattened dough sections through pasta machine, starting with the largest setting (0), then (1), then (2) until you’ve formed lasagna strips. 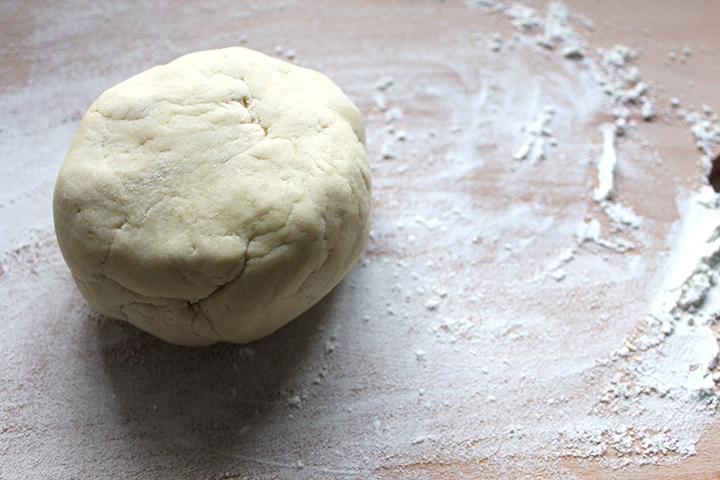 If dough starts to pull apart, you can fold it back onto itself and roll through whichever setting twice. You can also cut dough in half after running through the machine to make shorter strips. 5. Run lasagna strips through the fettuccine cutting section of your pasta maker. 6. Cook noodles in boiling salted water for a couple minutes. They will cook quickly and float when done. 7. Drain pasta from water and serve with your favorite sauce, cheese, herbs, etc! 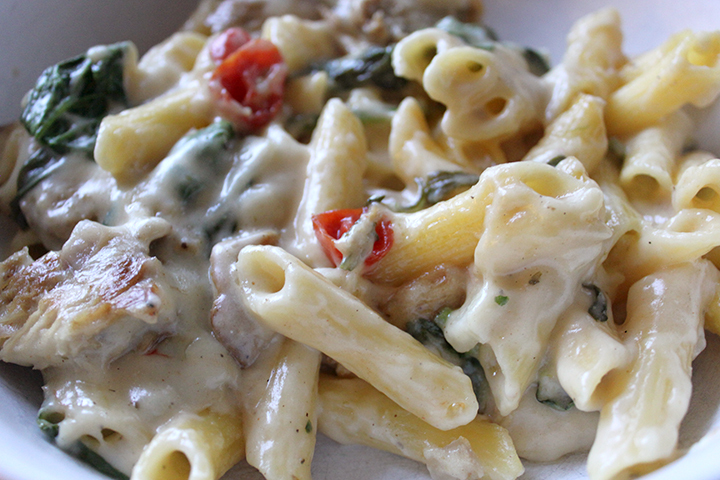 This is a delicious recipe, a twist on my original White Cheddar Mac and Cheese, just loaded with lots of extra goodies like chicken, tomato, and spinach. A great way to take Mac and Cheese from a side dish to an entree! Enjoy! 1. Boil water and cook pasta according to package directions (I like my pasta al dente). 2. In large skillet, melt butter (over medium/high heat). Stir in garlic, shallot, mustard, and cayenne pepper and cook for about 1 minute. 3. Whisk in flour, stirring and cooking another minute or so until golden. 4. Whisk in broth and milk and stir constantly for 10 minutes or so, until sauce bubbles and thickens slightly (turning heat down to medium if needed). 5. Stir in cheeses until melted. Salt and pepper to taste. (I sprinkle in a little Italian seasoning as well). Stir in cooked pasta. 6. Stir in cooked chicken, tomato slices, and fresh spinach. Cook, stirring, for another minute or so until spinach starts to wilt slightly. 7. Enjoy as is or place in glass baking dish, sprinkle with toasted GF breadcrumbs, and bake in the oven at 400 degrees for another 30 minutes or so until nice and bubbly! P.S. If you do decide to bake afterwards, I would suggest only cooking the pasta on the stove until it begins to soften, but is still slightly crunchy. Otherwise baking it might overcook the pasta and get too soft/mushy. As it is baking, the pasta absorbs more of the sauce and it is delicious! But, let’s be real, I’m usually ready to dive in and eat it and don’t have time for that! I liked guacamole but was never a huge fan until living in Savannah for grad school and being invited over for a get-together at my Colombian friend’s house. Her and her sort-of grandparents had prepared a lovely spread of arepas and toppings, salsa, guac, chips, and sausages on the grill. I’m not sure if it was just the lovely Savannah courtyard, the beautiful weather, and the company of lovely people and friends, but I became obsessed with the fresh guacamole they served! I ate so much of it and was craving it in the days and weeks afterwards. So I started making my own and ate so much of it that year! I love it best with Fritos corn scoops, but it is also great on arepas, tacos, etc. Enjoy! 1. 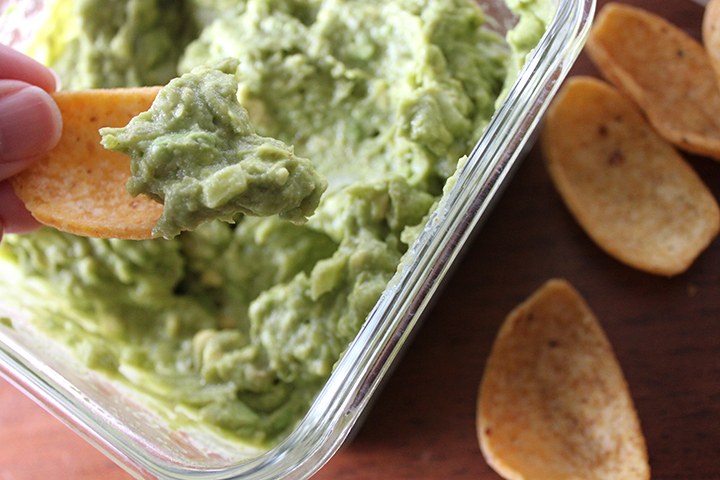 Scoop out avocados into bowl, lightly mash, and toss with fresh lime/lemon juice. 2. Add other ingredients (salt, cumin, cayenne, pepper, onion, garlic) and stir until combined. P.S. The lime/lemon juice will help keep the avocado from browning, but I still recommend storing in an airtight container and smoothing the top layer down to minimize air exposure. 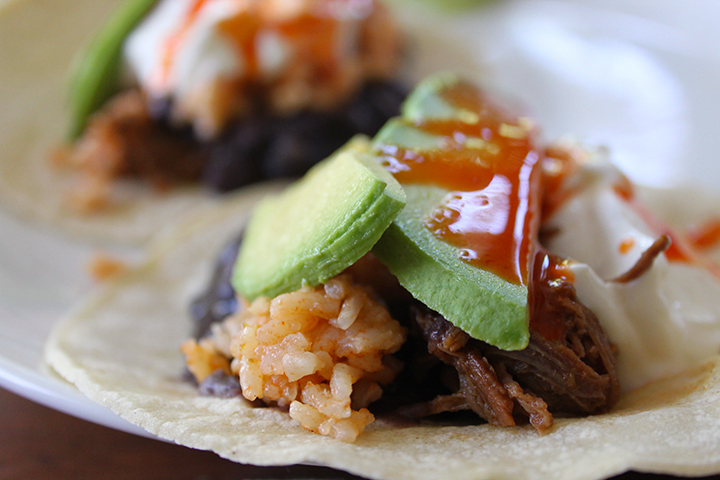 Shredded pork Carnitas (stuffed into arepas, on tacos, or in burrito bowls) is one of our favorite meals! So delicious and simple to make. 1. Melt butter or olive oil in dutch oven on the stove. 2. Salt and pepper pork on both sides and brown both sides in melted butter/oil. 3. Add onion and garlic to sides of roast, cooking slightly in remaining butter. 4. Add lime juice, orange juice, chicken broth, cumin, and oregano and stir until combined. 5. Put lid on dutch oven and place into oven. Cook at 350 degrees for ~3 1/2 hours. 6. 1 1/2 hours through cooking, flip roast. After another 1 1/2 hours (~3 hours total), roast should be tender enough to shred. At this point, I shred the meat up with a fork, removing any large bits of fat and the bone (if it has one). Stir shredded pork into juices, place back into oven, and cook for a remaining 30 minutes or so until tender and flavors are combined. 7. 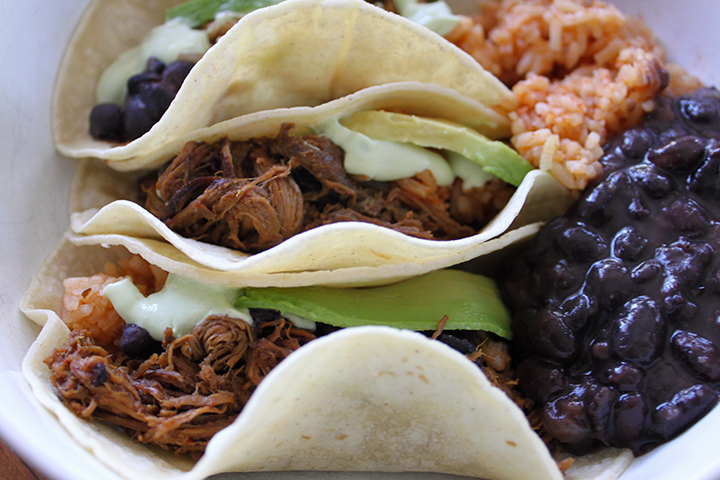 Enjoy on tacos, in burrito bowls, or stuffed into arepas! Lately, arepas have been my newest food obsession! 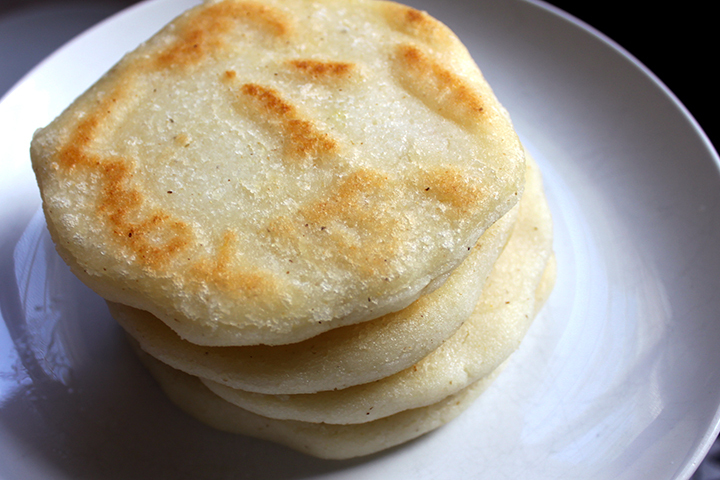 An everyday food in Columbia and Venezuela, arepas are a cross between a tortilla, cornbread, and a biscuit. They are naturally gluten-free, so I’m finding them to be the perfect quick and easy bread for sandwiches! We have a really great arepas restaurant in New Orleans (Maïs Arepas if you are in the area) and I found myself missing it while in Savannah. But out of limitation, comes innovation! I’m so happy I decided to try making my own arepas at home. So quick, easy, and delicious! ***UPDATE: My local grocery store stopped carrying Donarepa so I switched to using P.A.N brand arepa flour instead (I actually like it better and I’ve found it to be more universally available). I’ve found that each brand of arepa flour needs slight adjustments to the flour/water ratio, so best to follow the directions on the back of your arepa flour. With P.A.N. arepa flour, I use: 2 1/2 cups warm water, 2 cups P.A.N. arepa flour, 1 tsp salt, and 1 Tbsp or so Kerrygold salted butter. This makes 6 larger (~5 in) arepas. 1. Measure arepa flour into a medium sized bowl. 3. Stir wet ingredients into arepa flour until thoroughly combined and a soft dough forms. 4. Let dough rest (allowing the arepa flour to absorb more of the liquid) while electric griddle heats up. 5. Form dough into a ball and separate into four quarters (or six parts if using the larger P.A.N. recipe). 6. Shape each quarter of the dough into a ~4 inch thick flat circle (or ~5 if you want larger arepas). 7. Cook arepas on both sides in coconut oil on a flat electric griddle (at 350-400 degrees) until slightly golden on each side. 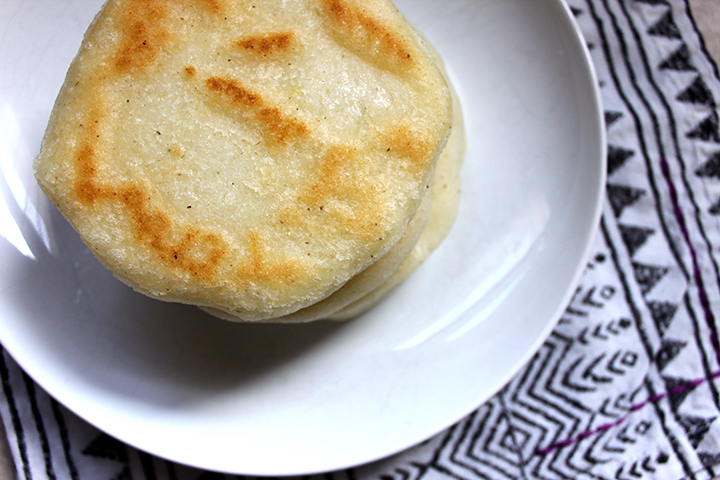 Arepas should be soft on the inside and slightly crisp out the outside. 8. Enjoy as is, with cheese and melted butter, cut open and stuffed with meat, cheese, etc, or however you’d like! 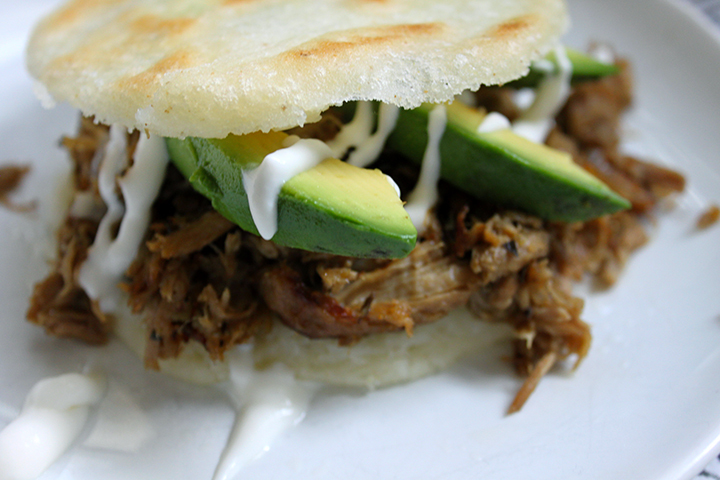 I love them stuffed with white cheddar, shredded pork carnitas, avocado, and crema! P.S. I strongly recommend using a non-stick electric griddle for making arepas. I’ve tried making them both on the stove in an iron skillet and in the oven instead and neither way has turned out very well. I’ve always had great success with these on an electric griddle and I use it all the time for making pancakes, tortillas, and other things as well! 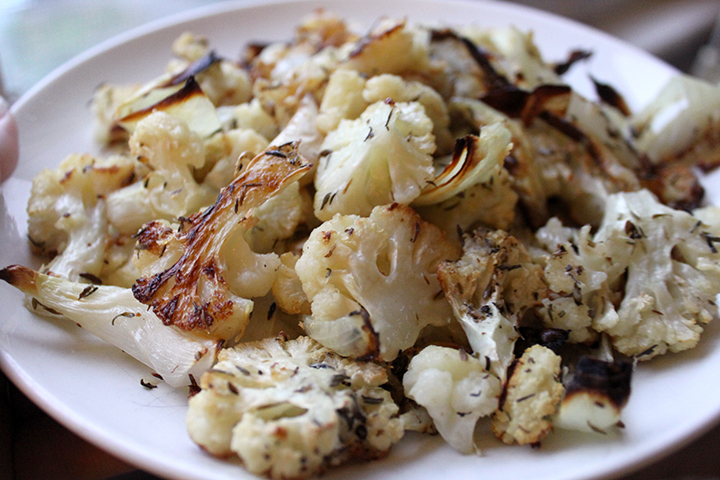 Roasted cauliflower is my latest vegetable obsession. I can’t get enough of it roasted with herbs, onions, and garlic. So delicious! I love that it is healthy, but also hearty. It is substantial enough to almost be a meal by itself! 1. Preheat oven to 425°F and line a large rimmed baking sheet with parchment paper. 2. Wash and remove leaves from cauliflower. Place cauliflower head on a cutting board and slice top-down into 1/3 inch slices. Break up cauliflower slices into florets and place into large bowl. 3. Add sliced onions, whole garlic cloves, herbs, olive oil, salt, and pepper to bowl with cauliflower. Mix well. 4. Spread cauliflower mixture into a single layer on prepared baking sheet. 5. Roast in 425 degree oven, tossing occasionally, until cauliflower is tender and browned at the edges, or about 30 minutes. 6. If desired, sprinkle freshly grated Parmesan cheese on top and return to oven for another 5 minutes to melt. This is my own take on a dish my family would always have at holiday meals. It seems like most families (in the Midwest especially) have their own take on this dish – called Texas Potatoes, Funeral Potatoes, or as I like it simply put, Cheesy Potato Casserole. It had been years since I’d had it, mostly because I can’t have cream of chicken soup (its not gluten-free!). I think condensed soups are an odd ingredient in food anyway, and I would prefer to avoid them, gluten-free or not. So here is my more whole foods version of this family staple. Drew and I don’t make it often, but it is the perfect thing to bring to potluck family or work meals when you need something cheap, easy, transportable, and that stays warm or reheats easily. 2. Mix together potatoes, cheese, sour cream, water/broth base, salt, pepper, garlic powder, onion powder, and Italian seasoning in large bowl. 3. Spread mixture into a 9×13 inch glass baking dish. 4. 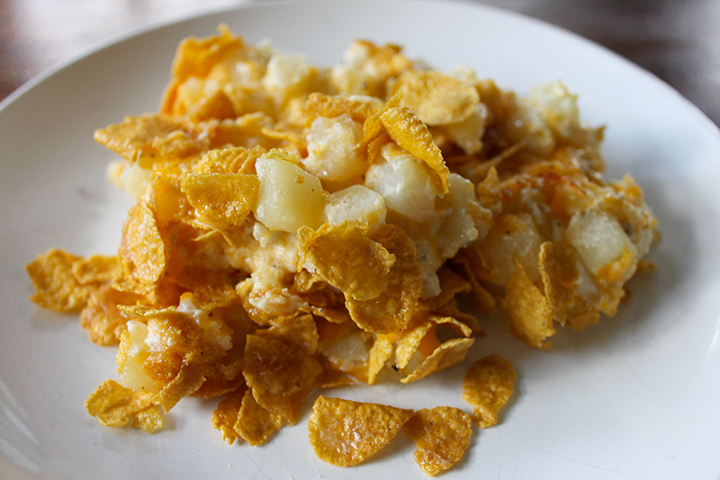 Sprinkle cornflakes on top. 5. Cut 1/2 stick butter into slices and spread slices out across the top of casserole. 6. Bake in 350 degree oven for 45 minutes, or until golden and bubbly. 1. In a small bowl, mix minced garlic, de-seeded and chopped chipotle peppers, salt, pepper, garlic powder, chili powder, cumin, adobo sauce, tomato paste, and lime juice to form a seasoning paste. 3. In dutch oven, melt butter. Lightly salt and pepper both sides of beef roast. Sear the roast on both sides in melted butter until browned. 4. Add chopped onion to the sides of beef roast in dutch oven and lightly saute. 5. Rub seasoning paste over all sides of roast. 6. Add water and beef broth to pan, pouring beside meat, leaving seasoning paste intact on top. 7. Put lid on dutch oven, and cook in 350 degree oven for around 4 hours, or until tender. 8. Shred with a fork (I usually shred it around 3 1/2 hours in and let cook for another 30 min after) and serve! P.S. You can also make this in a crock pot, cooking on low for 8-1o hours. Growing up, cornbread was a daily staple at my grandparent’s house. We had it often enough at our house too, only usually in muffin form. 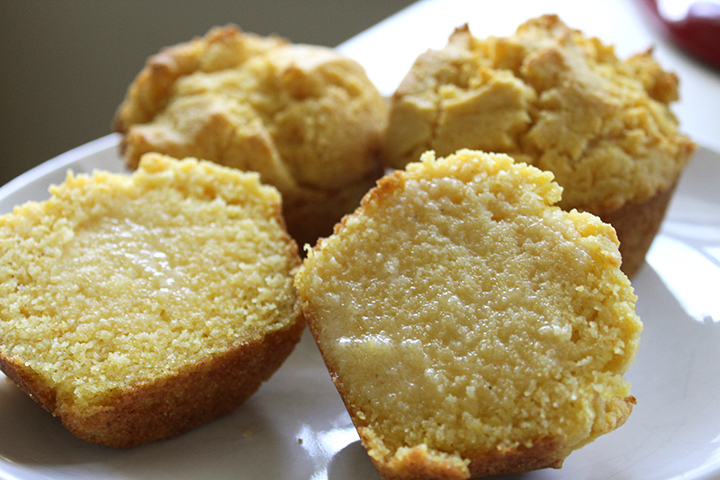 My grandparents made drier, unsweet cornbread (that my Papaw often experimented with and threw in whole kernels of corn or jalapenos) and my Mom always made hers sweet (and a little more cake-like) with Jiffy Corn Muffin Mix. After going gluten-free, I thought cornbread would be a quick and easy replacement for bread with meals. However, Jiffy Corn Muffin Mix is not gluten free. I’ve made many different GF cornbreads, all good, but none the same as that muffin mix. That is, until I came across this recipe by Smitten Kitchen. 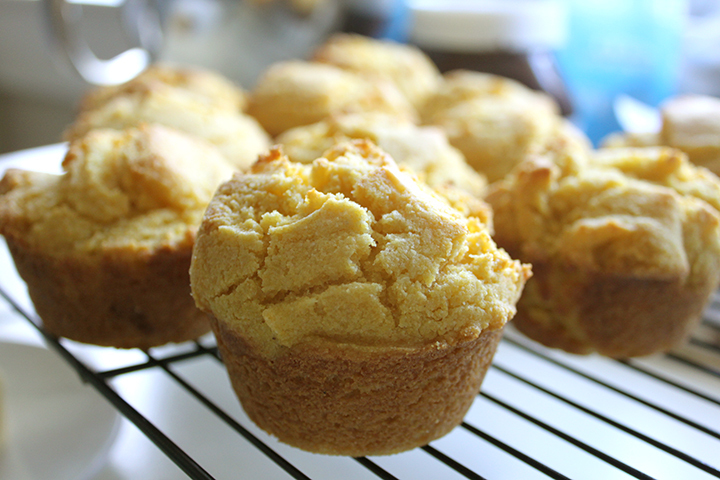 These are seriously the best, homemade cornbread muffins — gluten-free or not. 1. Heat oven to 425°F (220°C). Grease 12-cup standard muffin tin. 2. Mix 1 1/2 cups cornmeal, flour, baking powder, baking soda, and salt together in a medium bowl. 3. In a medium saucepan, combine milk and remaining 1/2 cup cornmeal. Cook cornmeal/milk mixture over medium high heat for a few minutes, stirring constantly, until it’s thickened to a batter-like consistency. 4. Stir melted butter, sugar, and sour cream into cooked cornmeal. When mixture is cool enough to not cook the eggs, whisk in eggs and stir until combined. 5. Fold in flour mixture until thoroughly combined (batter will be thick). 6. Divide batter evenly among prepared muffin cups (will mound slightly above the rim). 7. Bake until tops are golden brown and toothpick inserted in center comes out clean, 13 to 17 minutes, rotating muffin tin halfway through baking to ensure even cooking. 8. Let muffins cool in muffin tin on wire rack for 5 minutes, then remove muffins and let cool 5 minutes longer. Serve warm with butter and/or honey. 1. Combine sliced meat and marinade ingredients (soy sauce, rice vinegar, sugar, garlic, ginger, salt, pepper, lemongrass) in a glass or plastic bowl with a lid. Stir together. Place lid on container and return to fridge. You can leave beef to marinade for a few hours if you like, but I generally just let it sit while I prepare the rest of the meal. 2. Cook rice and prepare salad ingredients. 3. Heat skillet or wok. Over medium-high heat, melt one tablespoon butter. Once butter is melted, add beef (including marinade) and cook several minutes, stirring occasionally, until cooked through. 4. 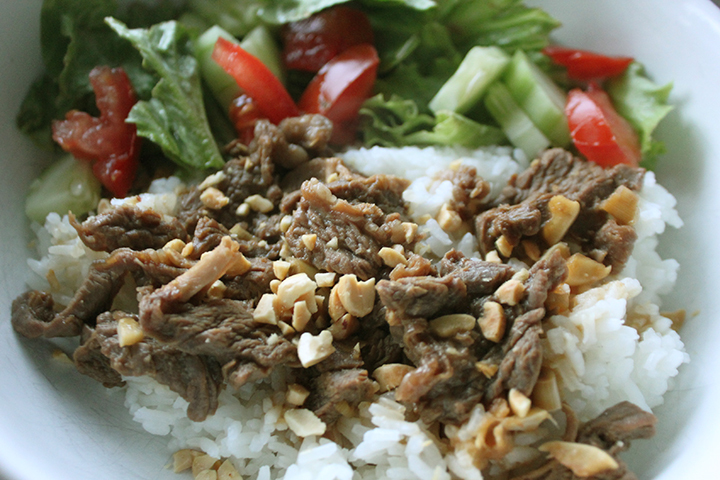 Serve beef over a bed of white rice with salad and chopped peanuts (this is my favorite, so that the rice soaks up the beef juices) or serve beef on top of salad with rice on the side. Get access to product launches, exclusive discounts, and free downloads! COPYRIGHT © 2019 CAITLIN WALLACE ROWLAND, ALL RIGHTS RESERVED.